Printed circuit boards are usually made of fiberglass (FR4), which is highly abrasive and given the many hundreds or thousands of holes on modern circuit boards, requires the use of specialist tools. PCB Supplies supply the highest of quality Tungsten Carbide contour routers. We hold stock of SC/FT Series Routers; these Routers have a right hand, up draft design which lifts debris upwards out of the hole being drilled rather than allowing it to fall into the hole causing the bit to bind and break. These Routers also feature a chip-breaker geometry, this chops the swarf into smaller parts and helps to reduce the radial load on the spiral flute this reducing bird nesting and binding and general wear producing more accurately cut, cleaner edged holes. The SC/FT Series Routers are suitable for peripheral contour routing. 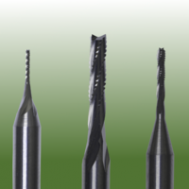 This series have a beneficial effect on burr reduction.